Experiment with different surfaces. Instead of using traditional paper, consider experimenting with some unique surfaces. Kids will enjoy painting on the bumpy texture of bubble wrap. Or, allow your children to create their masterpieces with a silver background provided by tin foil. Use a variety of tools. The options are virtually endless when it comes to painting tools. In addition to paint brushes, kids enjoy creating art with sponges, Q-tips, paint rollers, balls, kitchen utensils, the wheels on toy cars, and their fingers! Involve water. 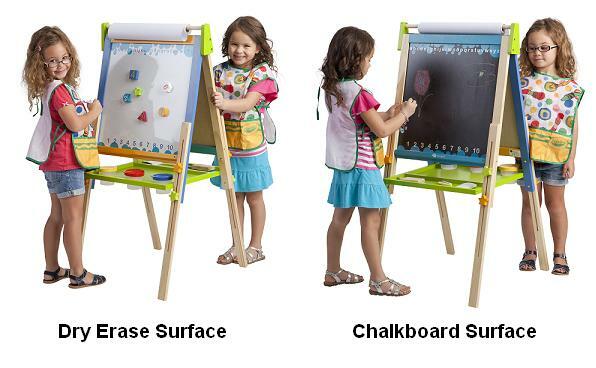 For easels that include a chalkboard, painting with water is a popular activity for kids. An added bonus is that there’s no actual paint involved– which means an easy clean up! You’ll just need some paint brushes and a cup of water and then your little artists can get to work! The Ecr4Kids 3-in-1 Art Easel enhances creativity with the ability to interchange between 3 different canvas options: chalkboard, dry erase board, and paper. Get abstract. To create an abstract masterpiece, your kids can paint with straws or even a water gun. When using a straw, simply apply a generous amount of paint to their chosen surface and then blow the paint with the straw. Or let the kids practice their aim by filling a water gun with paint and use the art easel as the target (you might want to try this activity outside). Voila: an abstract work of art is born! Forego paint. We often associate art easels with painting, but there are many ways kids can use an easel without involving paint. They can use pieces of nature like sticks or leaves to create outdoor-inspired art. Or, they might enjoy decorating different surfaces with fun and colorful stamps. To learn more about our easels and other classroom products, please contact us today!